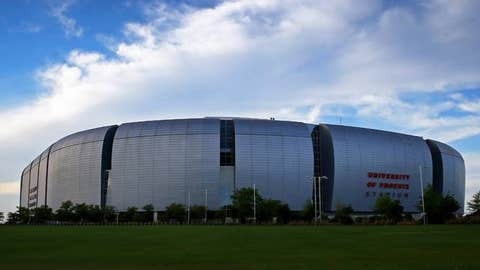 University of Phoenix Stadium will host the College Football Playoff championship game in 2016 as well as a semifinal game in 2017. The College Football Playoff on Monday announced Glendale, Ariz., as the host site for the 2016 national championship game. The College Football Playoff format begins next season, with two semifinal games taking place in the Rose and Sugar bowls ahead of the 2014-15 championship game in Arlington, Texas. The semifinals in 2015-16 will take place in the Orange and Cotton Bowls ahead of the title game at University of Phoenix Stadium on Jan. 11, 2016. The Fiesta Bowl Committee submitted the successful bid for the 2016 national championship game, beating out competing bids from New Orleans, Tampa Bay and Jacksonville. The national championship will be the eighth held in Arizona. The 2011 and 2007 title games were held in Glendale, while title games in 1987, 1989, 1996, 1999 and 2003 were held at Sun Devil Stadium in Tempe. The Fiesta Bowl, along with the Chick-fil-A Bowl, will be semifinal hosts for the 2016-17 season. The 2017 national championship game will be played in Tampa, Fla.